This was the perfect escape for our entire family. 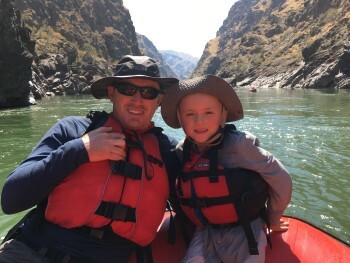 Our rafting adventure was sandwiched between a trip that started in Portland and ended in West Yellowstone. It was nice to have someone else plan our day once we stepped into raft. The medium amount of fend-for-yourself accompanied by full-service camping was the perfect amount of balance for our needs. We love to do-it-ourselves but it's also nice to sit back and enjoy the view once in awhile. We enjoyed the attention guides took in accommodating all of our requests during the float. It was a luxury to have all the meals prepared at each camp site and the variety of food and drink was excellent. 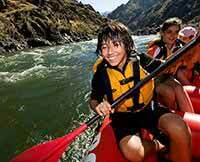 The guides were exceptionally knowledgeable about the river, environment and rafting. I did not expect to learn so much about the area, it was a bonus for us. The jester for the kids was an awesome feature for us parents and preparing kid meals ahead of the adult courses was always perfect timing. I can't say enough about the guides, they really crafted the experience and allowed us to enjoy our five days together on the river to the fullest. We look forward to inviting our extended family members on a trip with WRE/ROW in the near future.